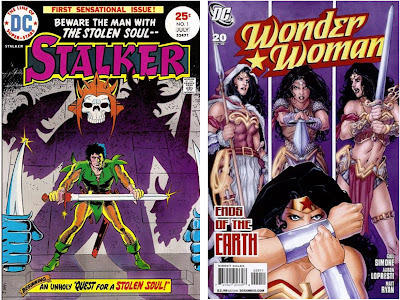 Thought I would share a link to a guest post I did on the DC Bloodlines blog reviewing 1970's issue Stalker #1 as well as Gail Simone's 'Ends of the Earth' story arc in Wonder Woman. The Flashpoint event starts in earnest in June with the multiple mini-series that flesh out this new universe being released. I have vowed in the past to never get too wrapped up in events like and yet it looks like I will be getting a number of the Flashpoint minis. 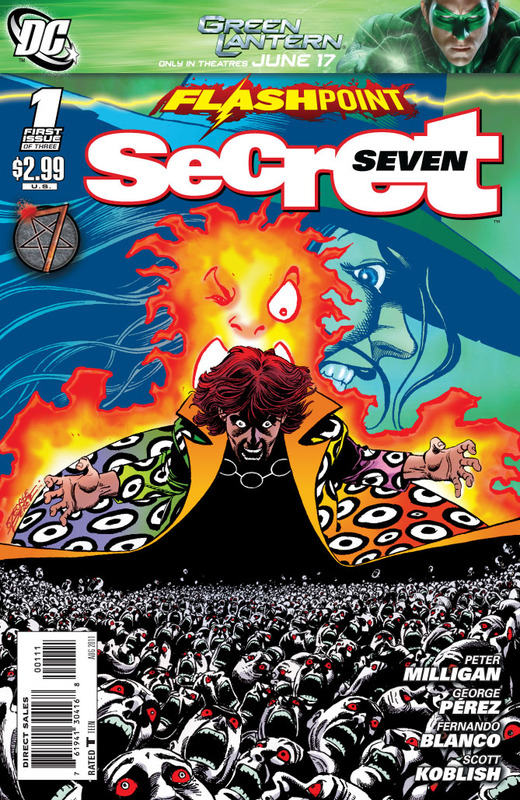 Perhaps the one that I am most interested in reading is Secret Seven, written by Peter Milligan and drawn by George Perez. The creative team alone would probably be enough to get me to buy but the book also stars Shade the Changing Man, one of my favorite DC characters. Milligan wrote the fantastic Vertigo version of Shade, so this will be like coming home. But another character that is going to be in the book is also on the cover. 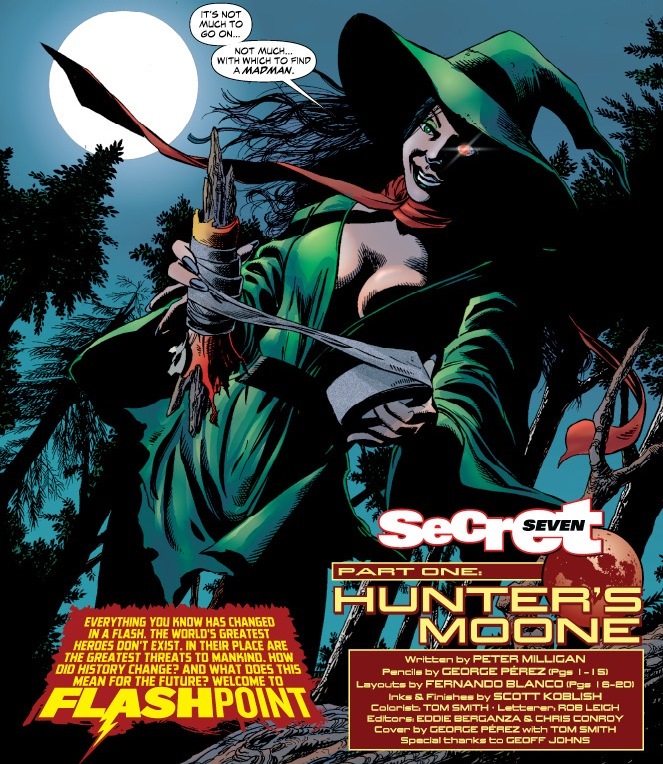 The DCU's version of the Enchantress also stars in the book. The Enchantress of the non-Flashpoint DCU was a reluctant hero who occasionally veered to evil when she used her magic too much. She maybe be best known for starring in the John Ostrander Suicide Squad book. 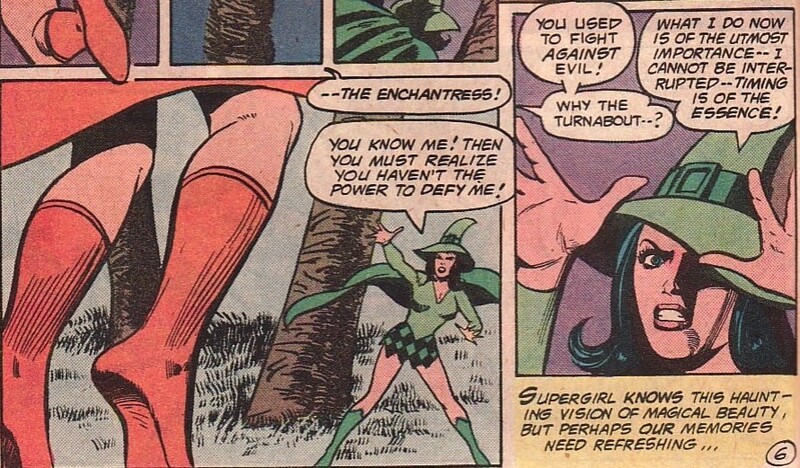 But the Enchantress also has some history with Supergirl. With June Moone weaving her magic again, I thought now would be a good time to head to the back issue box. 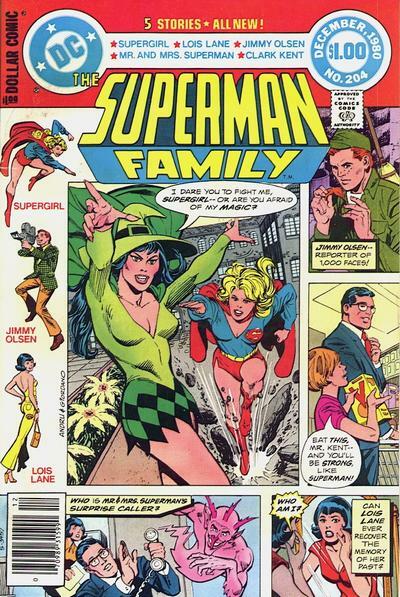 Supergirl battled the Enchantress in successive issues of Superman Family, starting with Superman Family #204. Supergirl was the lead in this book and even I will admit that these aren't the best stories. 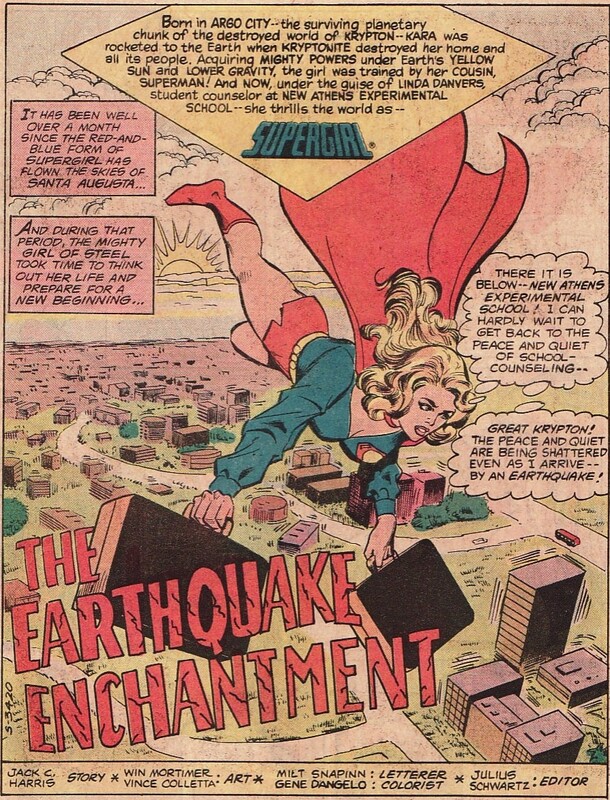 'The Earthquake Enchantment' was written by Jack C. Harris with art by the team of Win Mortimer and Vince Colletta. 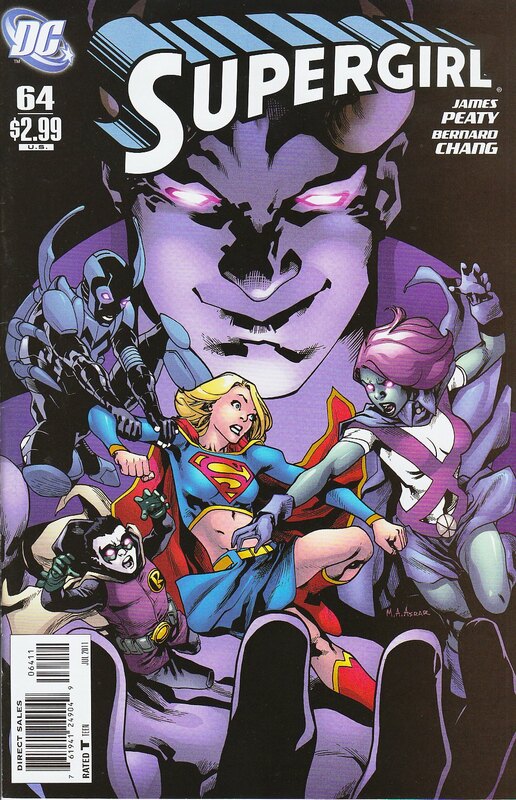 This was the Supergirl team on the book for some time, especially Win Mortimer who drew Supergirl's stories until the end of the Superman Family book. 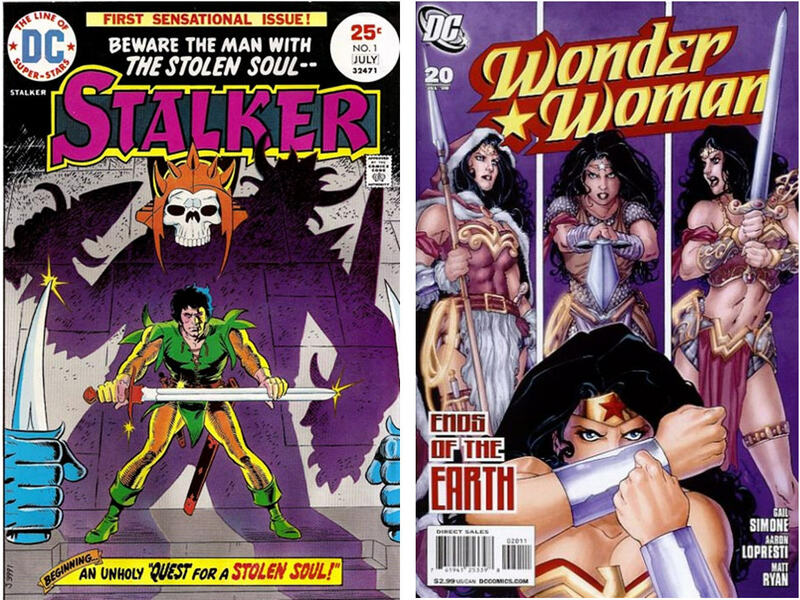 Harris wrote a bulk of her stories although a number of others did as well including Marty Pasko and eventually Paul Kupperberg (leading into his Daring New Adventures run). At this time in Supergirl's life she was a guidance counselor at the New Athens Experimental School in Santa Augusta Florida. This story opens with her returning to the school after a break, flying home carrying her luggage! It is an odd opening to an even odder story. 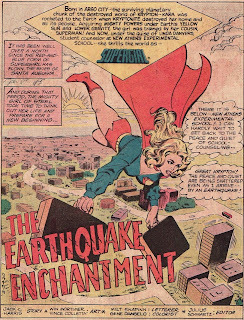 As she flies over the campus, an earthquake rattles the school. 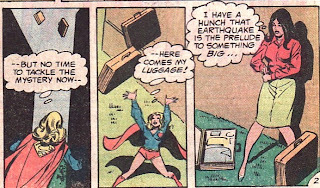 To get her hands free, Supergirl flings her luggage high into the air and zooms to the ground to help out. But after a few seconds of heroics, stabilizing some buildings, the earthquake ends. 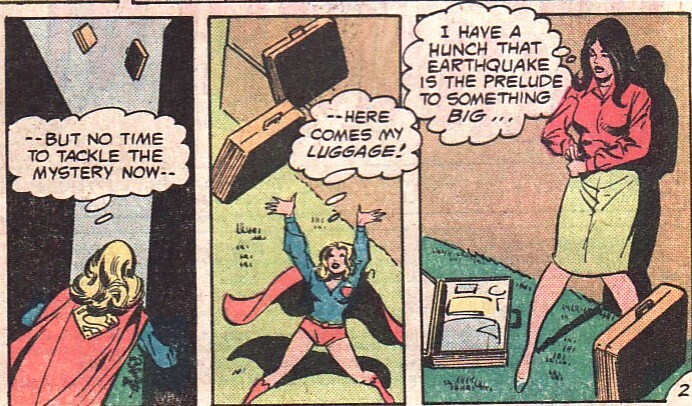 And it's a good thing that the quake was so brief; it allows Supergirl to catch her luggage as it falls back to the ground. Okay, the 'toss the luggage in the air' maneuver is odd enough. But changing into Linda Danvers on the campus grounds rather than in a room seems even odder. It is bizarre moments like these that make me realize that the Silver Age was nearing its end in 1980. It doesn't make too much sense for Supergirl to do any of this, not when she could put her bags down on a roof, on the ground, or just about anywhere else. The school's staff are thrilled to see Linda back. And there are some new additions. The school's new parapsychology department has hired June Moone, an expert of sorcery. I guess an Experimental School would have parapsychology professors. One of the staff science teacher is quick to note that the school's seismograph did not measure the earthquake. At least by scientific methods, the earthquake did not appear to happen. Later that night, another quake hits the area. Burrowing underground, Supergirl finds the epicenter and tunneling back up to the surface. The center of the quake is the New Athens campus and standing there is the Enchantress. That's why the quake didn't register on the seismograph; it was a magical earthquake. The Enchantress seems to be exuding magical energy because Supergirl feels weak and sickened just being in the sorceress' vicinity. 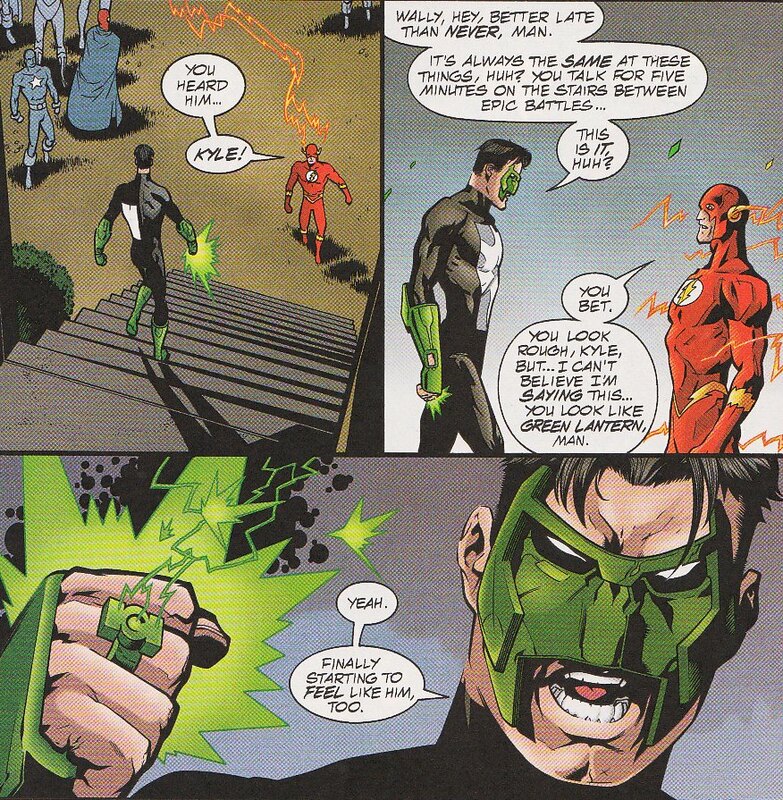 While the two square off, Harris retells the Enchantress' origin. June Moone was a young artist invited to a costume party being held at an 'old estate castle'. There, she accidentally discovers a hidden chamber which is the home for a magical creature named Dzamor. Granted mastery over sorcery, The Enchantress defeats a monster at the party and vows to use her powers from then on to battle evil. It is a standard origin story for the Silver Age. I do like the look of Dzamor. But back to the fight. The Enchantress refuses to stop the quake saying that what she does must be done. Of course, the quake is endangering lives. 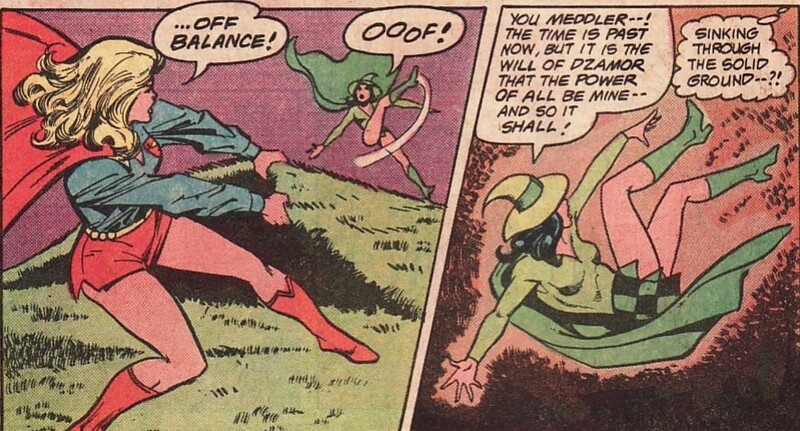 If Enchantress won't stop on her own, Supergirl will stop her. And since she can't get near the Enchantress, she has to do it from afar. 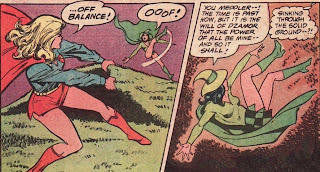 Ripping up the sod, Supergirl upends the Enchantress, forcing the sorceress to retreat. The next day, Linda decides to do some research Dzamor, the name the Enchantress shouted during her escape. Thumbing through a rare old volume about the nether gods (the Experimental School really has a lot of resources), Linda runs into June Moone. Moone talks cosmic events when conditions are exactly right during which the old gods can impact the modern world. In something of a leap, Supergirl puts all the cryptic things the Enchantress said during their battle as well as Moone's comments to come to a conclusion. Santa Augusta must be the 'focal point of an astral alignment' which will give the Enchantress unlimited power. I suppose it 'makes sense' but it still seems like a stretch to go from those comments to that conclusions. But, it turns out that Supergirl is right. A third earthquake rocks the school. And the Enchantress says that the current alignment will grant her the power to eliminate all 'science based' super powers on Earth. And then, armed with near limitless power, she will use her magic to rid the world of evil: crime, sickness, terrorism, and war. 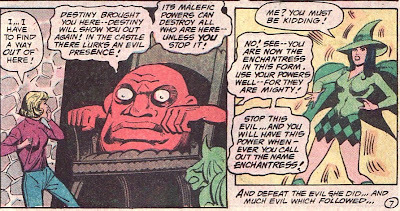 Throughout her comic history, and here included, the Enchantress has walked a fine line between being a hero and a villain. Her goals might be noble, but her means aren't right. 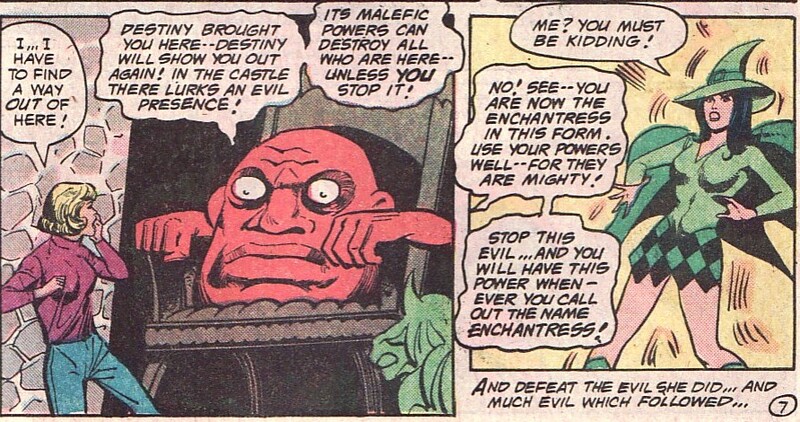 And those goals might sound nice but Supergirl realizes that the Enchantress seems pretty unstable. Absolute power in her hands doesn't sound as good as her promises. And with more magic rippling off the Enchantress, Supergirl knows she needs to get far away. Straining, she is able to get up, up, and away into space. 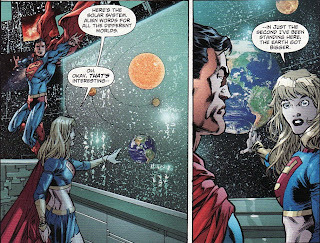 And up in space, Supergirl realizes that anything that puts the heavenly bodies out of alignment will break the 'perfect' confluence and turn off the power rushing into the Enchantress. 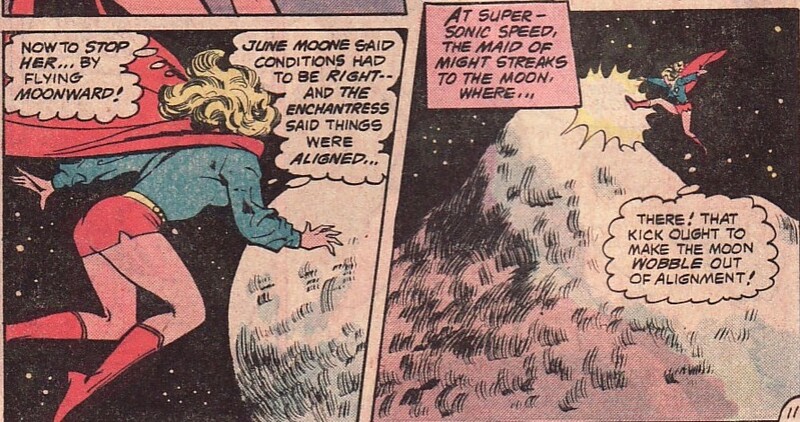 In a perfect moment of late Silver Age lunacy, Supergirl literally kicks the moon slightly out of its orbit. That is one mighty kick! You either love moments like these for their lunacy or hate them for their stupidity. I tend to nostalgically love them. I mean how can you not like that second panel? Before coming back to Earth, Supergirl kicks the moon back into its right orbit. But this isn't the end of the Enchantress/Supergirl feud. 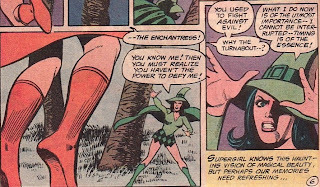 Supergirl knows the Enchantress is lurking around. And June Moone isn't going to forget her vow. She will clash with Supergirl again, and soon. I will admit that almost all the Superman Family Supergirl stories tend to be forgettable. But any story where Supergirl kicks the moon in and out of orbit is just wacky enough to hold a special place in my heart. I credit Harris for saving the Enchantress from DC limbo. This was her first appearance since the late 60s. Mortimer's art is workmanlike. From a Supergirl collection viewpoint, this issue is of low importance (as almost all the Superman Family stories are). It can probably be found for under $5 at conventions and stores. Hard to believe that the Boston Comic Con was only a month ago. From a blogging point of view, that is a lifetime ago. So this is the last post recapping that convention. While I use a sketch book for my commissions, I decided that a fun thing to also do would be to get Supergirl commissions on the sketch covers of Marvel books. Marvel does a very nice job of having sketch covers for many of their bigger releases. I don't know if DC has ever done it. My hope is to make these a more humorous part of my collection, poking fun at Marvel while elevating Supergirl. I mean wouldn't it be fun to see Kara holding Thor's hammer like it wasn't a big deal? Bending Wolverine's claws? A couple of years ago, I saw Ethan Van Sciver do a 'Hal Jordan as Skrull' cover on Secret Invasion and I thought that was interesting. So as I walked around the convention, I saw Michael Dooney's table and thought he would be a great choice for my inaugural sketch cover. 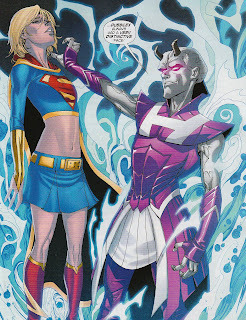 Who would ever think of Supergirl being a Skrull spy! I thought this was a silly and unique sort of commission to have in my collection. And I think Dooney did a great job with it. I especially like the pointy ear poking through her hair. I think moving forward, I will try to get local and lesser known artists to do these cover commissions for me, a way for me to pay things forward for the artists trying to break into the business as well as have a little fun. I have sketch covers for Spiderman, New Avengers, Thor, X-Men, and Fear Itself. If anyone has cool ideas for how to do a Supergirl commission on those covers, let me know! 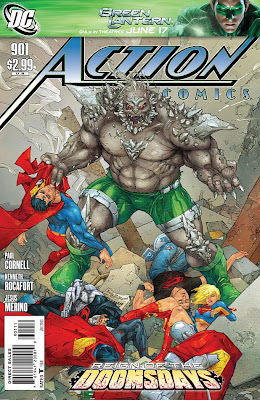 Action Comics #901 came out this week and is something of a new direction for the title. With the Lex Luthor story over, the time has come for Superman to reclaim the book as his. On top of that, new artist Kenneth Rocafort comes on board (at least for half the issue). Writer Paul Cornell is still on board and I am very interested in reading his Superman. While I think that the Black Ring story sort of wheezed to an end, the opening chapters with Lex interacting with DC's super-villains were very good, the right mix of characterization, dark humor, and wild action. 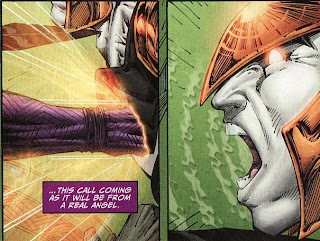 Cornell inherits the end of the Reign of the Doomsdays storyline. I think in some ways that is good and bad. The good is that we will immediately see Superman interacting with a lot of his mythos ... Doomsday, Team Superman ... and we will get to see how Cornell will write Superman. The bad is that any Doomsday story is going to be filled with slugfests and splash pages. And while those action scenes might be fun, it will take away space for story-telling and characterization. I am hopeful ... hopeful ... that Rocafort will eventually take over all the art on the book. While Jesus Merino (who assists here) is a capable artist, Rocafort's stuff is electric, beautiful. Trapped within this 'pocket universe' space ship, Superman gathers the Superman Family around him and realizes that they need some time to figure a way out of this mess. 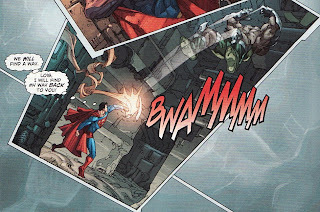 And knowing that the Cyborg Superman is only going to be a hindrance to his plans, Superman eliminates the Cyborg in one swift move, removing the 'central node' from his chest. So, I will admit that I have never seen this done before nor have I heard about the central node either. One of the interesting things about the Cyborg was that he was so absolutely difficult to defeat. He could inhabit any mechanism, leaving his body the way Swamp Thing does with plants. Is this the first mention of this key component? 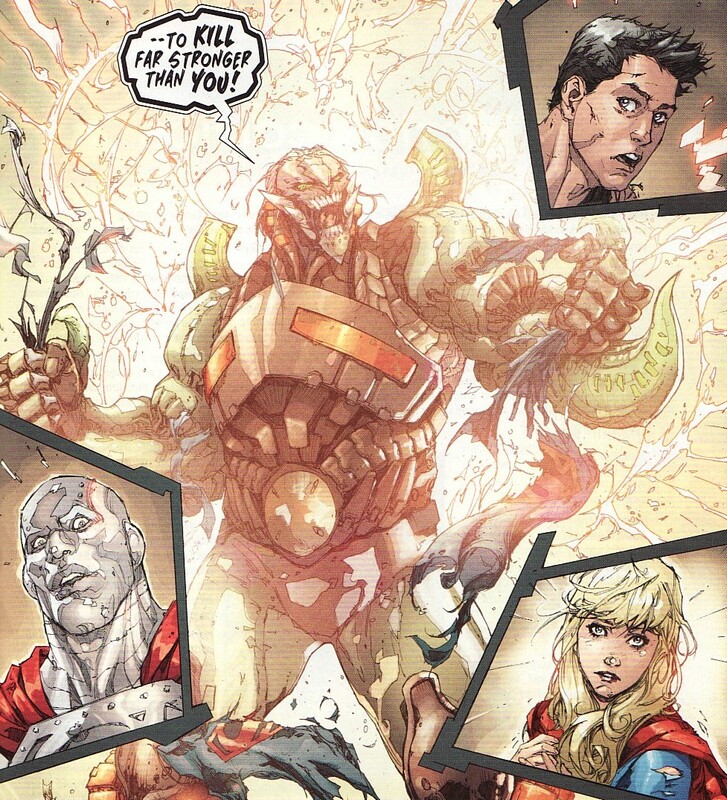 When the three remaining Doomsday clones (remember Supergirl tossed one down a 'endless tunnel' last issue) rush the heroes, Superman and his Team take off taking the Cyborg central node and the original and emaciated appearing Doomsday as well. 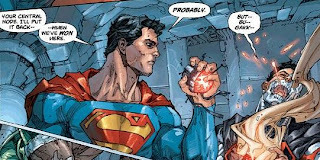 Superman says the Doomsday might give them some information about the others. So there are lots of questions that need answering but the ongoing threat of the Doomsdays means there isn't much time for exposition. What is this place? Luthor may have discovered it, but did he drop the Doomsdays in there? Safe for a moment in a different chamber, the Superman Family has a second to catch their breath. One thing that Cornell clearly has a grasp of is the close family relationship between Kal and Kara. This Supergirl hug just feels natural and unforced. 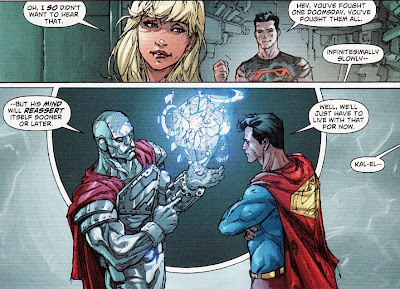 I like how she figures out that Superman had them take Doomsday so that he wouldn't get harmed by the other clones. Superman even admits that was his concern. What I don't get is why he would be concerned. 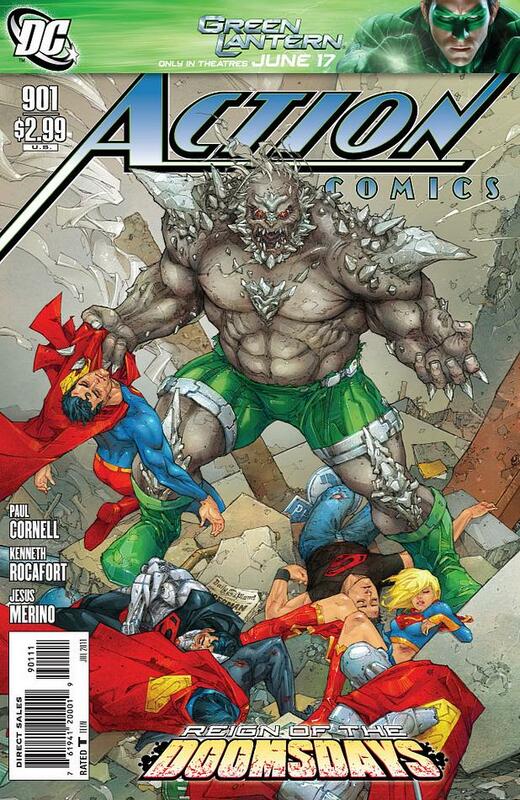 Ummm ... doesn't Doomsday resurrect when killed? In that sense, he can't be harmed. And hasn't Superman gone after Doomsday in the past (like in Superman:The Doomsday Wars and Superman/Doomsday Hunter Prey)? The reason the team is on the run is because Superman knows the Doomsdays can't be defeated or stopped long term. So I preferred the 'he might provide clues' answer than this one, even if it does show how magnanimous Superman is. As I expected, I love Rocafort's take on Supergirl. And, in fact, Steel is able to detect Doomsday's brain functions slowly improving. The original Doomsday will be awake soon. I like the response from Supergirl and Superboy. I like her realism and his optimism. There isn't much time to think as the Doomsday clones come attacking again. 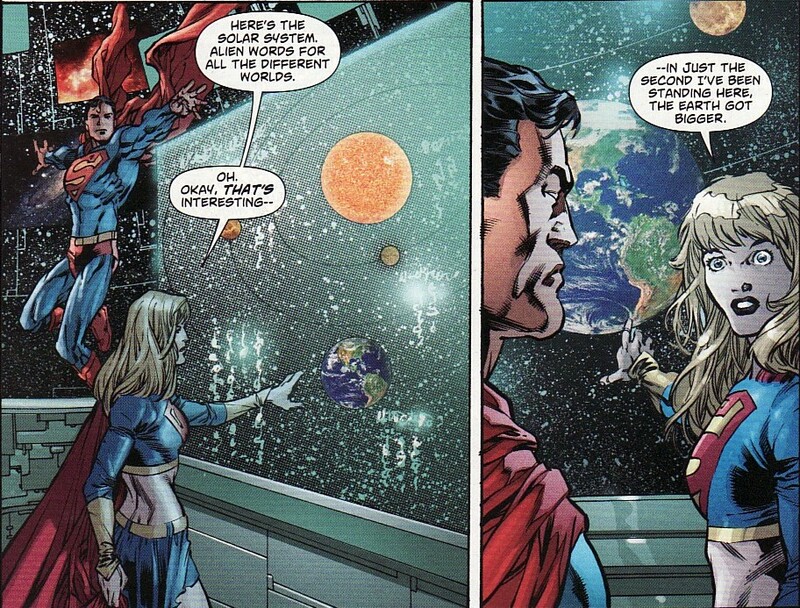 Superman wonders if maybe they should seal the Doomsdays in this satellite, even if that means sacrificing themselves. Luckily that fatalist thought of sacrifice fades. I like this panel where Superman promises Lois he will return. We need some Superman and Lois scenes ... and soon. But the first part of his thoughts is dead on. Why are they fighting here? If this place is an endless labyrinth, why not just bust out and fly home leaving the Doomsdays and the Cyborg Superman inside. Cornell must also have realized that this would be an easy ending to the story. Superman tells the team that it would take 10x the brute force to break out than it did to break in. There is no explanation behind that, so I guess I have to roll with it. Then again, how did Lex move about here with ease? And it turns out that they aren't alone in this ship. We see something in the shadows earlier activating the ship's engines. The ship is on a collision course with Earth! In 10 minutes, the ship will crash into Earth destroying the planet. There isn't time for anything other than super-heroics to save the planet. President Obama goes on the air and says to Superman that his country needs him. Do I dare pick the scab of the Goyer story last month? I do find it interesting that both Roberson in Superman and Cornell in Action have scenes coming off the heels of Action Comics #900 where Superman is clearly American and proud of it. The scenes must have been written before the flack of Goyer's story happened. So they can't be responses to that story; this is how those creators view Superman. I also didn't think Obama was the President in the DCU. But I might be wrong on that. Despite this being an 'endless ship' and a 'pocket universe', Superman got a good enough view breaking in to lead Team Superman to a control room. 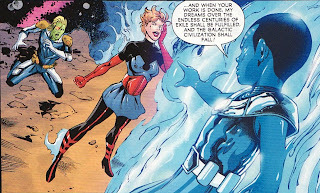 There Supergirl realizes that the ship is heading towards Earth, and quickly. Suddenly the threat of Doomsday has to take a back seat to saving the world. In a very nice scene, we see Superman take charge, rallying the troops, asking them to find a way to save the world. There is no doubt here, Superman is in charge. And his team respects him. How great to see that instead of the sullen Superman walking around in the early Grounded or the Superman attacked by Earth's heroes in WONK. Superman is back where he belongs. Before they can find the engine controls, the presumed owner of the ship, the Doomslayer, shows up, saying that Earth must be destroyed. Doomslayer has a lot to digest visually. There is this faint green glow about aspects of him which make me wonder if he has some Kryptonite in him. He has both velociraptor style claws and forearm horns. And his face is very similar to Doomsday. Who the heck is he? He sort of looks like Gaiking, doesn't he? Or is it just me? 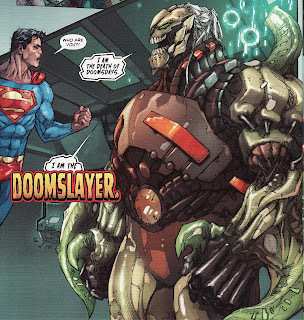 And then, to make sure we realize that the Doomslayer is a real threat, he rips apart the Eradicator! 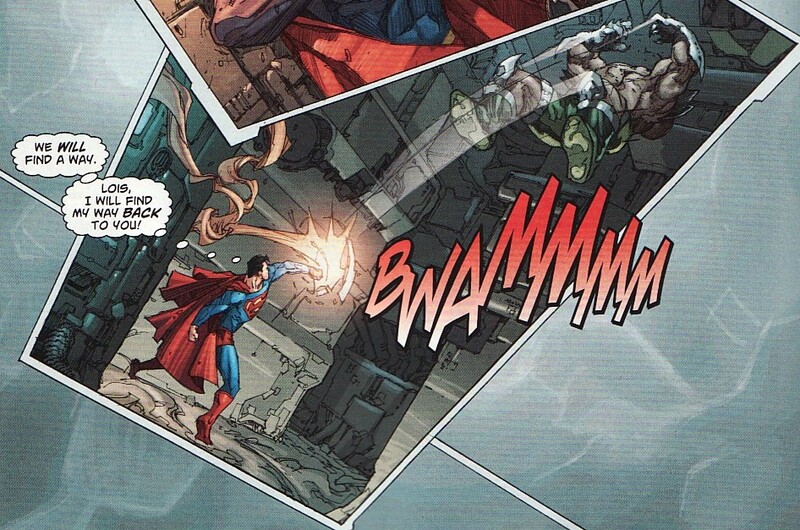 Well, there goes my guess that the Eradicator will somehow energize Superman like the end of Reign of the Supermen. So I thought this was a decent issue to set the stage for the rest of this story. We finally have a bit of story in Reign of the Doomsdays as opposed to the opening chapters which were mostly the heroes getting battered. But this issue really asked many more questions than it answered. What is this place? Why was it at the site of New Krypton? Who is the Doomslayer? Is this whole thing a Luthor plot? If it isn't, how did he move around this place setting up the Doomsday trap for Superman? Wouldn't Doomslayer be upset with that? Why does Earth need to be destroyed? Whew ... a lot of questions. I suppose that is what a middle chapter is supposed to do. It is keeping me interested and guessing. I just hope the Luthor part of this is explained more. Add to that, the incredible incredible art by Rocafort, albeit half the pages. 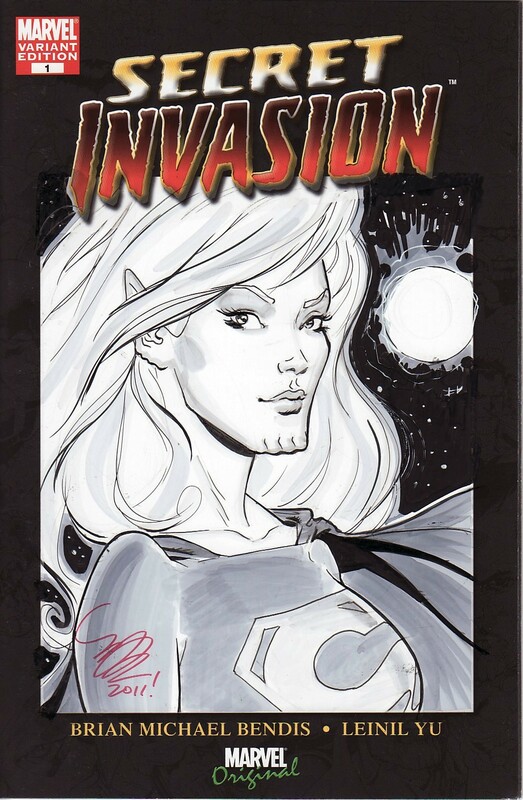 I would love to get a Supergirl commission from him. That means this issue shows tremendous story-telling potential for this arc, maybe more than I expected. And that probably bumps the rating up half a grade. 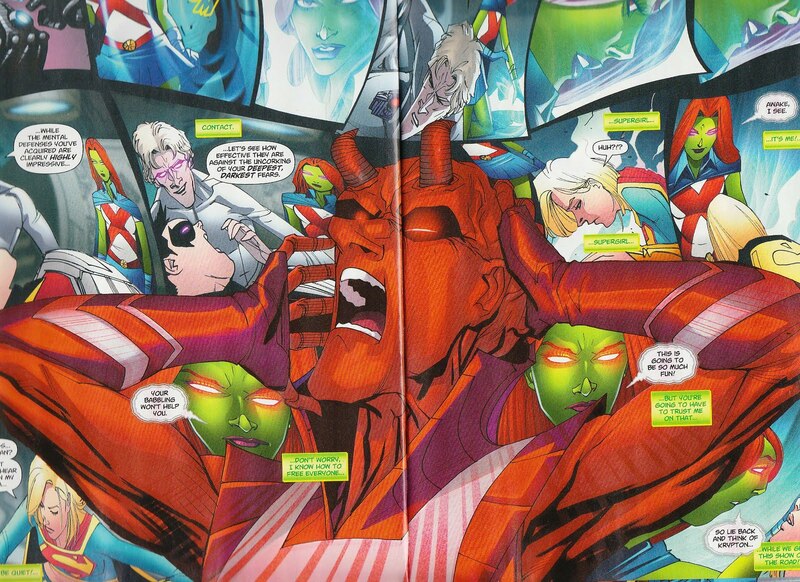 Legion of Super-Heroes #13 came out last week and continued the Legion of Super-Villains arc. This was a middle chapter in this arc of Saturn Queen's quest to destroy the World of the Wise before turning her army towards Oa. The sad thing about this chapter was that in many ways it was a place holder. Not much happens in this issue to progress the overall story. Now don't get me wrong, there are some nice moments and small revelations here. But no major events happen in this issue. As a result, this issue felt a little flat for me. Paul Levitz does do a good job juggling the large cast of the Legion, checking in on some members who haven't been seen in a bit and giving them distinctive voices. I did feel that this may have been Yildiray Cinar's weakest issue on the book. It just seemed a little rough and scratchy in some places as opposed to the more finished look I am used to seeing from him. 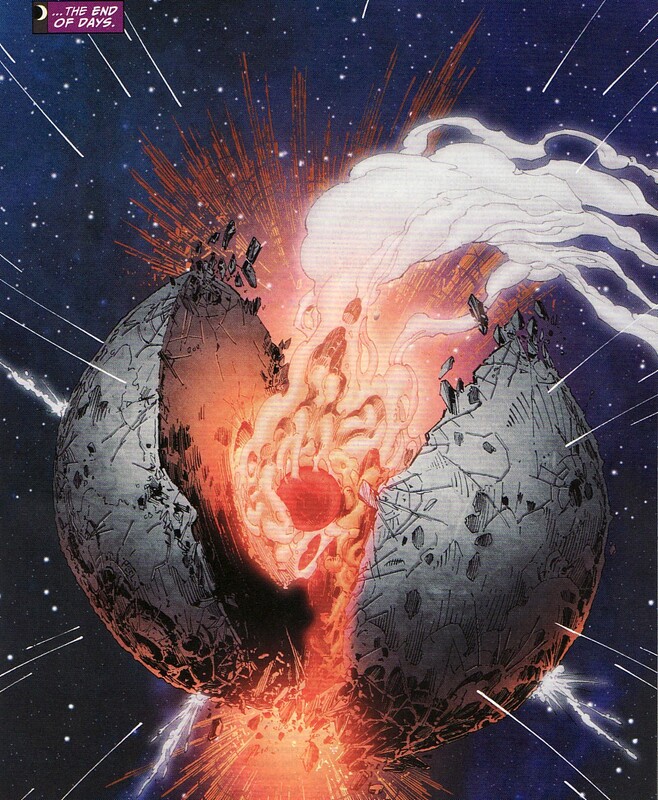 While Saturn Queen has left Colu with Zymyr, the remaining Super-villains do their best to recreate the landscape with destruction. I am pretty interested in this Immortus character. We know he was constructed on Zuun. But now we learn that his inertron body can regenrate. How can that happen? At first I wondered if this might be a suit housing another living Tromite. Then I thought maybe it is the Doom Patrol villain General Immortus' downloaded into this thing. Both are unlikely. 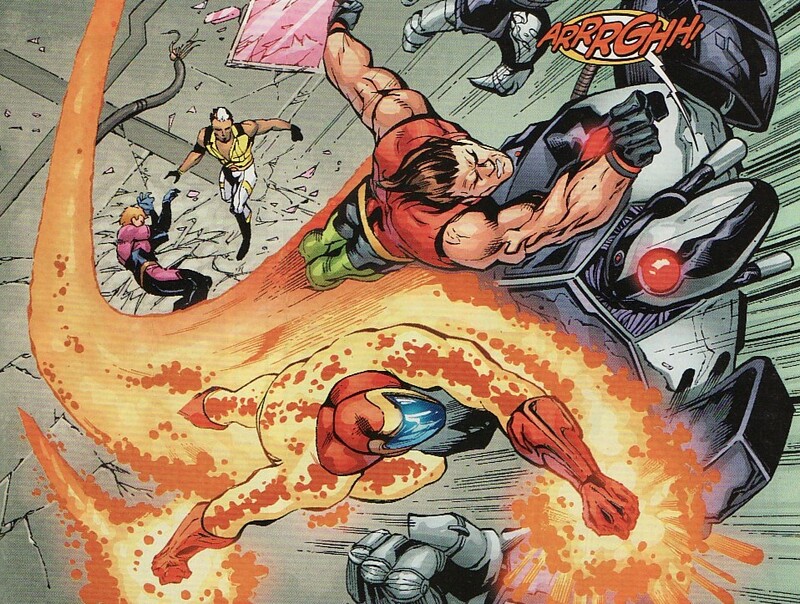 I was glad to see Element Lad thinking a little out of the box, using his powers for something other than disintegration or encasement. Another thing I liked was Invisible Kid calling Element Lad the mightiest Legionnaire currently on Colu. 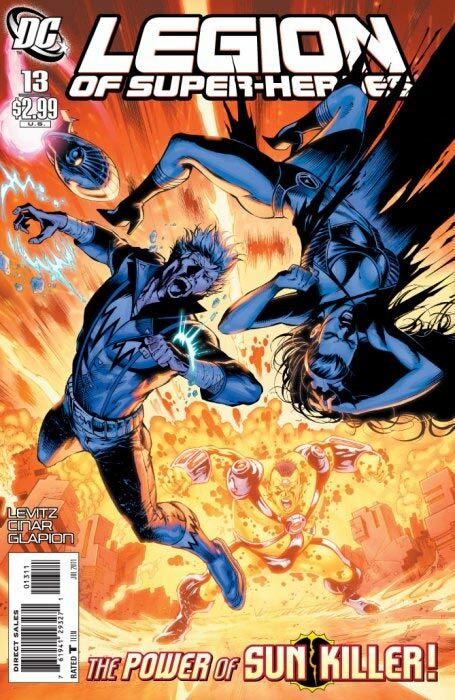 Element Lad could be unbelievably powerful. In what was one of my favorite moments of the issue, we get a look at our maturing blue flame entity. When Saturn Queen cannot find the World of Wise through her Coluan research, she calls upon the blue flame. He drops some hints about his powers and persona. He spreads terror, terror gives him form, and he has been exiled for centuries. I am going to stick with my original guess that this is Dark Opal from the Amethyst series. Any other guesses? Any terror or fear based villains I'm not thinking of? Maybe Lyssa Drak who kept the Book of the Black in Green Lantern? Another thing that Levitz does very well is show just how good a team the Legion are, how well trained they are, how well they work together. We've already seen Phantom Girl take out Atta last issue. Here we see Polar Boy and Quislet run interference while Shadow Lass takes out Sun Killer. Again, there is more to Tasmia than darkness. She can throw down with the bad guys too! It reminds me how in every Legionnaire's Who's Who entry they have some stock statement saying they 'passed Legion combat training and now martial arts'. I guess this proves it. Here was my favorite moment. Before the villains teleport off of Colu, Hunter finds Earth Man and makes him a proposition. 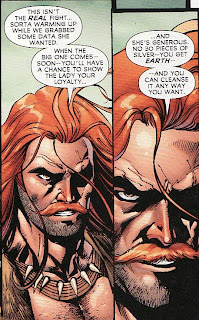 If Earth Man betrays the Legion and aids the LSV when the time comes, he will get Earth 'to cleanse'. It makes sense. 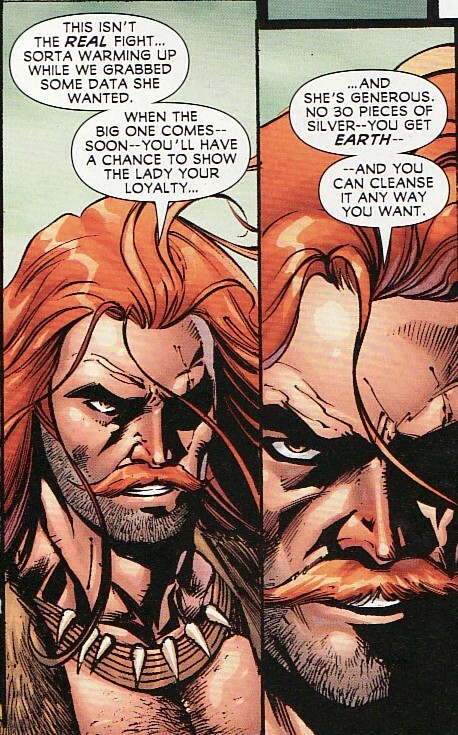 I never quite understood why Earth Man would have such a sudden change of heart and join the Legion to begin with. And he surely will be tempted. But we also know that a Legionnaire dies at the end of this arc. I suddenly have to put Earth Man at the top of the death list. Can't you see him die just as he proves to the Legion that he has put his xenophobia behind him, lashing out the villains one last time? It would show he has changed, is a 'true' Legionnaire, and have him die as a hero. Plus, he isn't a long-time Legionnaire so there will be less ripples through fandom. This was my least favorite moment of the book. While discussing the World of the Wise, Tellus senses an image in Gates that was also in Harmonia Li's mind. Maybe she knows something? Umm ... 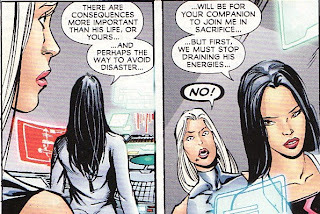 I am pretty sure she does since she just told Brainy she was responsible for what is happening on Colu two issues ago. Now why he didn't talk to her about that 'confession' since then, I have no idea. But he can't be surprised, can he? I also liked this splash page showing Mon-El trying to coordinate the team from the Legion headquarters. Surrounded by screens, talking to the Legionnaires, you can see him trying to put all the pieces together. But he doesn't look comfortable. I still can't believe Mon-El won the election. He has never struck me as a dynamic leader. I had to include this panel because Wildfire, my favorite Legionnaire, finally got some action. He and Ultra Boy arrive on Colu just in time to help get Immortus away from the unconscious Element Lad. And then Zymyr shows up and teleports all the members of the LSV away, including the members recently beaten by the Legion - Atta and Sun Killer too! Seems strange that the Legion would just leave them unattended and lying around for the other LSV members to drag them through a portal. So the Super-villains are now reunited and the Blue Flame will soon impart to Hunter the location of the World of the Wise. So a lot of noise on this front but basically the teams are exactly where they were last issue. Back on Earth, Harmonia Li again tries to tell someone that she knows something about this threat, telling Dream Girl that Star Boy will join her in sacrifice to stop the Blue Entity. Hopefully Dreamy actually asks her a few questions this time. Hmmm ... could it be Star Boy is the Legionnaire that dies? Nah. Too obvious. I hope the mystery behind Professor Li is explained soon. So there are some nice little moments to this issue as we get to see the villain evolving and the internal intrigue of the temptation of Earth Man. But the main story of Saturn Queen's threat sort of just tread water this issue. Still, even if this issue sort of underwhelmed, the arc continues to intrigue me. And I think Levitz is getting a handle on the massive cast here. And again, the art wasn't the usual crisp work I am used to on the title. Justice League of America #57 came out last week, the next chapter in The Rise of Eclipso arc by writer James Robinson and artist Brett Booth. This is the fourth chapter of the arc which has been building in momentum. 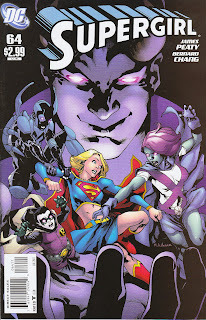 This issue certainly moved the story forward as we learn a bit more about Eclipso's ultimate plan. We also get some movement on personal storylines as Alan Scott, Jesse, and Obsidian's stories all progress a bit. But I have to say that as we turn the corner of this arc, I feel that this issue actually lost some momentum, mostly around Eclipso's plan. It is true that Robinson has done a very good job making sure that this League fights big threats. We have seen the League fight the Starheart, Omega Man, and now Eclipso. But the problem is that sometimes the threats can feel so big that the story can veer towards lunacy. When I see what Eclipso is up to, the power he wields, I have to wonder just how Congorilla and Batman are going to defeat him. I wonder what Congorilla and Batman are even doing in this fight? The truth is though that this is probably Robinson's last arc on the book, at least with this team. So I guess why not go out with a bang. Still, I wouldn't have minded seeing this team beat the snot out of the Royal Flush Gang for a couple of issues, if only to catch my breath and see the characters interact when the FATE OF THE WORLD was not at stake. I do have to say that Brett Booth's art is just wonderful. I have really enjoyed his linework throughout his stint on the book. Very nice stuff here. I don't know too much about the back story of Mikaal Tomas Starman so I enjoyed this single panel where he remembers his home world and culture. I didn't realize he was from Talok III but I liked that a lot given that Shadow Lass is from Talok VII. Nice. Starman is seeing his life flash before his eyes but he is only unconscious after the shock of being rescued by Obsidian at the end of the last issue. 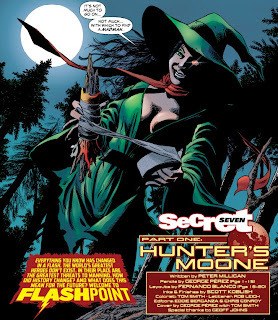 Obsidian has shunted them to a protected area on the moon, a place shielded by Alan Scott. The link between Scott and the Starheart has been severed. He is up and about again, healed, but with only what energy he has in him. Like a battery, his power will eventually dwindle. The Starheart's power now flows into Eclipso. One thing I did like was that Jesse's first concern is for Jade rather than her own loss. That is the selflessness of a hero. 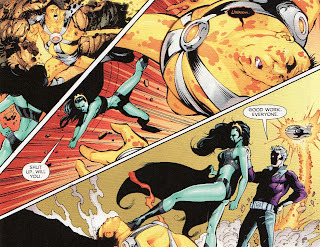 Unfortunately, we see Jade under Eclipso's complete control. In fact, she seems more like an automaton. Jade's plight was detected by Obsidian and that's why he showed up, his evil banter last issue a ruse. 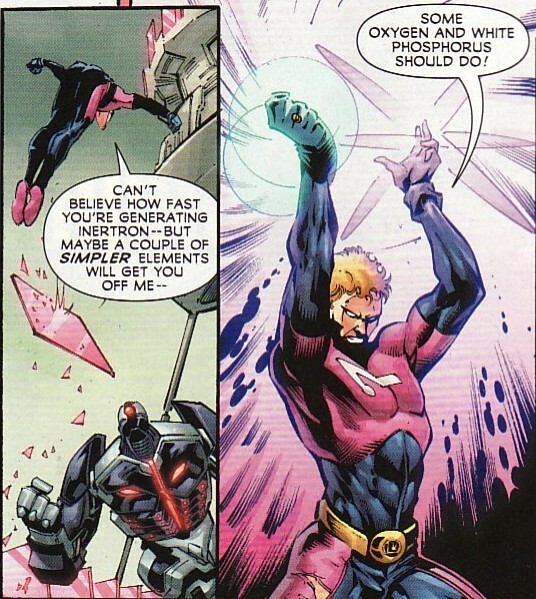 In a prior arc (JSA Princes of Darkness) Obsidian became immune to Eclipso's control. I didn't read that arc, so any information on what went down there would be appreciated. With the Starheart dumping all it's power into him, Eclipso is more powerful than ever. His weaknesses like light and holy power (Dr. Light, Zauriel) don't bother him any more. And his plan is still unknown. Obsidian, as a shadow, can somehow link to the hive mind of the shadow army and hears the plan. Somehow the chaos energy of the Starheart has opened up Eclipso's mind to grander ideas than he usually has, he has a better idea about the grand order of the universe. But to accomplish his goal, Eclipso needs even more power. 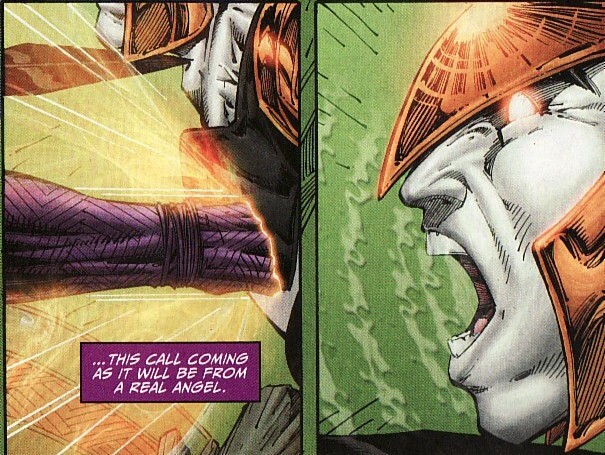 And to get that power to come to him, he needs Zauriel to release a distress signal. And what better way to do that than to torture the angel. Okay, nice imagery there, the fallen angel gutting the warrior of the faith. And thankfully, not too gratuitous. We don't see intestines, blood, etc. Obsidian realizes that Eclipso wants to kill God. Okay, Robinson may have just lost me. Just because we are starting to veer towards the absurd. 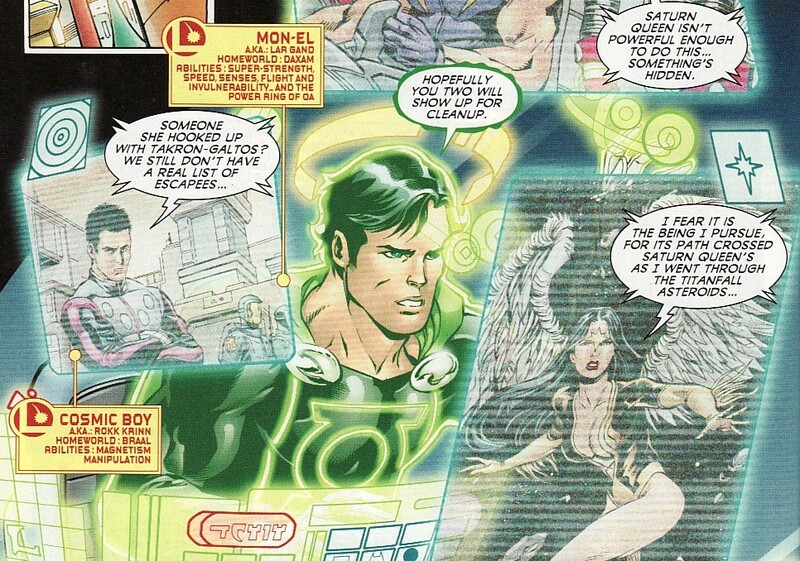 How can any JLA defeat something that nigh-omnipotent? Chuck a batarang at it? Punch it in the face? Well, in a nice twist, it turns out that The Shade is the keystone to the whole thing. 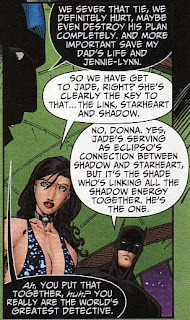 The Shade has the influence over the Shadow energy, the power that is giving Eclipso control over everyone (like Jade) and everything (like the Starheart). Sever the Shade's link and Eclipso will suddenly not be a threat. 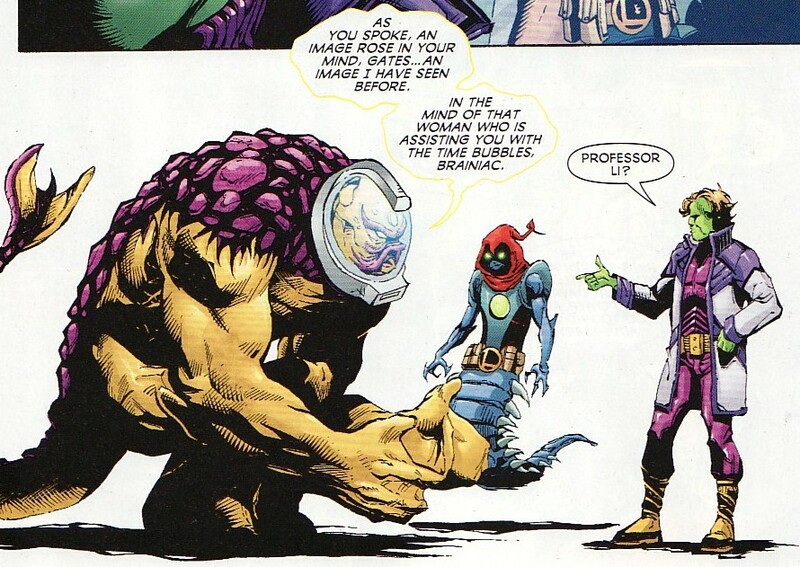 That's why the Shade was so important to Eclipso's plan. But it makes him the weak link in the chain. And just like that a plan hatches. Batman needs to get a hero from Earth up to the moon to bring down Eclipso. 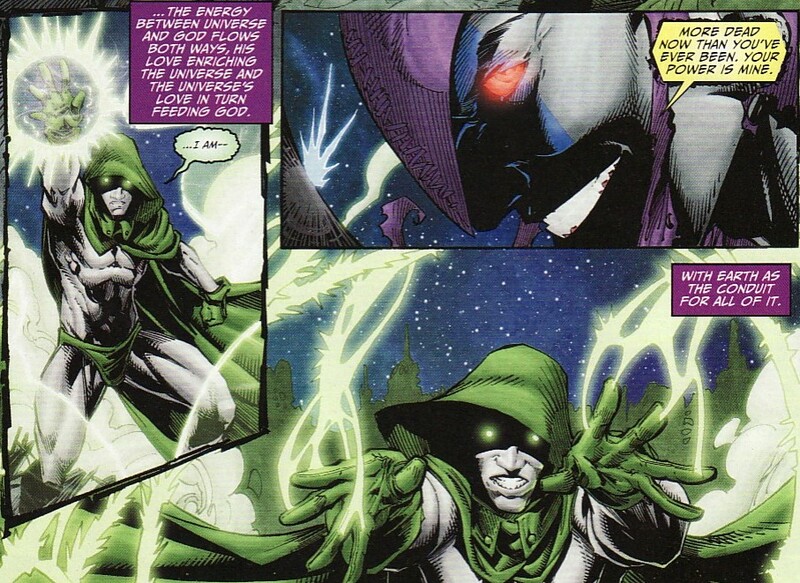 And St. Walker thinks someone on the team can negate Eclipso's evil. We know that future solicits say a woman is the last standing team member. So who is it going to be? Let's start guessing. I suppose somehow Jesse's power loss is somehow linked to this St. Walker idea. Maybe Eclipso is trying to keep her away from doing whatever she needs to be doing, robbing her of her powers to keep her at a distance. Or maybe it's Jade. The truth is, she probably has the power to drain Eclipso, or at least turn off the Starheart energy spigot. But I still hope it's Donna. Remember, she was basically the hero of Cry for Justice, freeing herself from being crucified to take out Prometheus. Maybe Robinson likes her just as much. Zauriel's distress call brings the Spectre to the moon. Eclipso provides some exposition ... which I don't know that I necessarily follow ... that the Earth is God's most favored planet. That God needs the love of Earth to sustain him, and so to destroy the Earth will kill God. 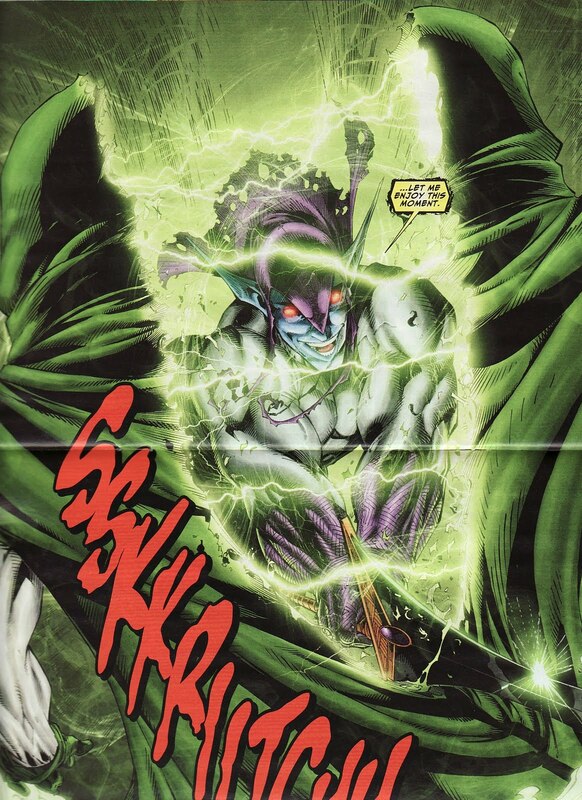 Anyways, the resulting shift allows Eclipso to kill the Spectre and gain all his power. 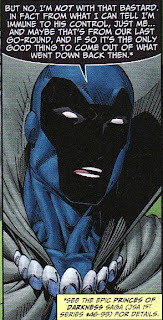 (Yawn) ... the Spectre loses again. So, when exactly was the last time the Spectre won a big fight? I can't respect the Spectre as a big threat anymore. He is now in the same category as Lady Shiva ... a yard stick. And frankly, it has gotten to the point of being overused. I am bored with the 'Spectre losing' panel. The last great one was way back in Alan Moore's Swamp Thing #50. And now, flush with power, Eclipso breaks the moon in half, exposing the gooey center. It just felt like too much. I mean where is there to go from here? How do you fix that? Anyways, there are 2 issues left in this arc so plenty of time to explain things. There are some hooks I am interested in ... Batman's mystery hero, which Leaguer has the power to take out Eclipso. But have we really come to a place that we need to split the moon and try to kill God to get a reaction from the readers? 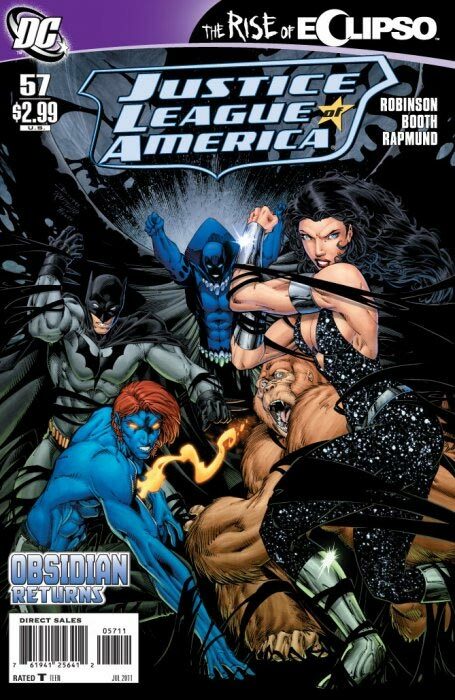 Still, I have come to like this JLA as a team so I will sad to see this roster dismantled. James Peaty was gracious enough to answer a couple of final questions I had now that his time on the title has wrapped up. I can't thank him enough for taking the time to expound a bit on 'Good Looking Corpse'. Anj: Hard to believe that 'Good Looking Corpse' is already behind us. Looking back, anything you would have changed? Do you have a favorite moment of the arc? James Peaty: Hmmm…tricky one. You always wish you could change things, but that’s usually just a line here or a moment you wish you’d dialed up or down differently. I suppose most of all I’d have liked to have had a bit more space. The cutting of monthly books down to 20 pages isn’t a killer – I’ve written plenty of the animated books over the years that are that length – but a bit more room for certain moments to breathe would have been helpful, I think. As for my favourite moment of the arc…well, I’m going to pick two. 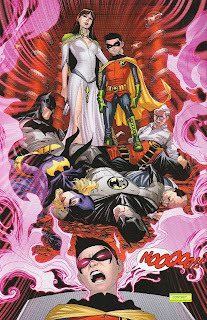 First one would have to be the ‘Robin’s worst nightmare’ splash page. I think it’s a moment that’s very true to the character, says a hell of a lot with a little, but – on a more practical level – it’s also the moment where I felt completely in control of the book and was writing specifically for Bernard. So to see it come to life as well as it did was a huge thrill. My other favourite moment(s) would have to be the scenes featuring Lois Lane, but especially that final scene on the roof in the last issue. 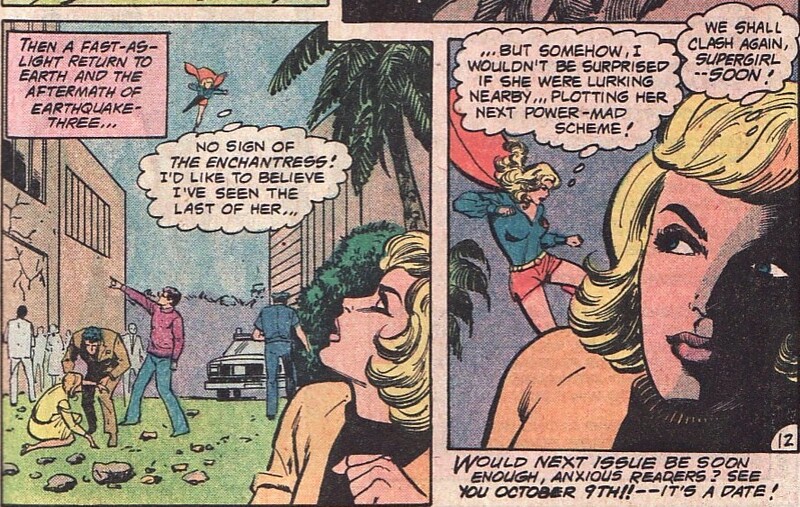 I think that whole exchange between her and Kara is classic Superman stuff…but with a slight twist. Loved writing that. 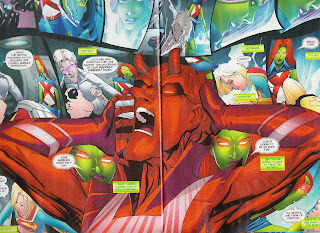 Anj: I loved the Damien page as well. The Lois/Kara dynamic fascinates me as almost every Supergirl writer has had the two interact in a meaningful way. I did think those scenes in this arc were excellent, showing how much that relationship has grown since the Superwoman storyline. JP: As the two most important women in Superman’s life (sorry Ma Kent!) I think it’s important that they have a relationship/dynamic that’s slightly separate from the Man of Steel. It makes the characters seems more alive and gives the whole DCU greater weight. It’s things like that that sell the idea of the DCU as being a cohesive universe rather than shoe horning in obscure continuity references here, there and everywhere. 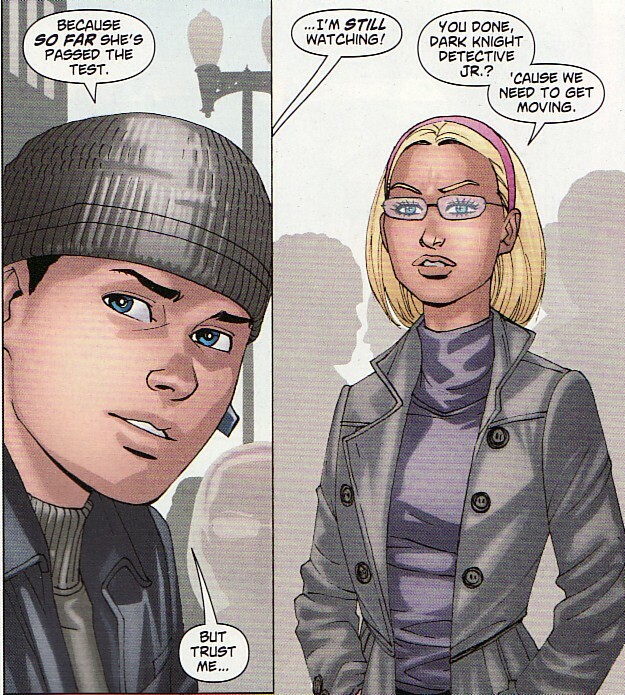 That’s why I was keen to work in the little reference to Cat Grant losing her son in issue 63. If you don’t know what Lois is referring to you can still read it and it works within the conversation, but if you know your Superman history - and certainly Sterling’s last couple of issues - then it has a greater resonance, I think. Anj: The reveal that Alex was a Dubbilex clone with some K-genes was a nice unexpected twist. Can you talk about that plot point? In the end, he seems complex with hate issues, mommy issues, and daddy issues. Was he tough to write? JP: Well, from the moment I joined he was always going to be a Dubbilex clone, but I honestly can’t remember if the K-gene stuff was added by me or was already there. If it wasn’t me then it’s something I completely agreed with as just making him a clone of an old character would have been quite dull. I also think It means he has a lot more potential – in terms of his powers etc – that can be explored if people want to use the character in the future. One thing I really didn’t want to do with his character was ‘fix’ him as being just this thing. That’s not – in my opinion – how good characters or villains come about. Yes, there’s a strong starting point for him because of the Dubbilex stuff, but lets not make that the only thing that’s interesting about him. As for his character having issues…well, he’s a kid. It’s never mentioned outright, but he’s probably only about a year old! He has the arrogance and indifference that the gifted, yet inexperienced have a tendency to wear as a badge. As for him being complex, I’m not sure about that. 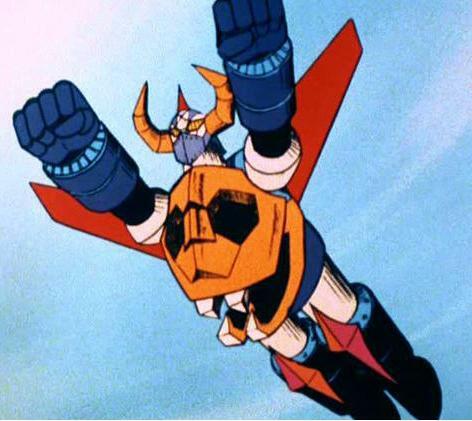 He dresses in purple armour and has horns on his head. He’s hardly subtle! But, joking apart, the whole ‘orphan’ thing tied into the themes of the arc about youth etc. I also thought – and not to be too glib about it – that in some respects he’s an abused child. He’s essentially been mistreated and raised in isolation since day one, so it’s not really a surprise that he turns out the way that he does. But was he tough to write? The whole arc was tough to write! Anj: As I said in my review, he seems like a replicant from Blade Runner, craving a full human experience, creating a family and friends, but not being mature enough to handle those 'real life' relationships. In that way, much like Roy Batty, he is a sympathetic villain. JP: Well, you always hope that’s the case. They key thing with Alex (and this relates to Batty as well) is that he doesn’t see himself as a villain. He’s just doing what he was built/grown to do, albeit in a slightly more…aggressive fashion! But then I think the same is true of heroes. Should they always be in the right? I’d say ‘no’, but then I think playing with the flaws and ambiguities of the characters is what makes writing fun. 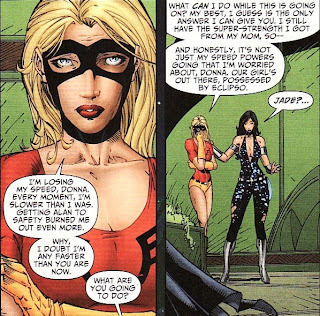 Anj: I was glad to see the Lois/Devereux plotline played out in the last issues. Was the plan always going to be that Devereux was to be an unwitting agent for Alex? JP: It was always my plan – as soon as I came onboard - that she’d be a key figure in the story, mainly, because it’d be pretty daft to introduce her in the first part and then dump her. Not only that, she was introduced as someone so significant that Alex actually took the trouble to kill her son. That’s a HUGE thing to bring into a story and one that you’re sort of duty bound to deal with once you do. It also has a certain amount of dramatic potential to it, so I guess I just homed in on that. I also felt that committing that crime defines Alex to some extent, so you want to explore that. Why would he did it? Well, there has to be a connection to Catherine. I also liked the idea that - when you look at the story as a whole - Catherine is the real victim. She loses absolutely everything and gains nothing. 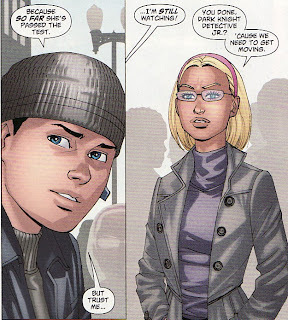 On a more practical level, keeping Catherine around meant I could legitimately keep Lois Lane in the story. More Lois is always a good thing! Anj: I liked seeing Supergirl leading the next generation of heroes, gaining some confidence. Were you happy how that plot turned out? Where do you think she stands in the DCU? JP: Yeah, I was. I think we did it in the right way, which is to make it something that grows from the character. In a sense the whole arc is about how Supergirl perceives herself and how that’s out of kilter with how others see her. It’s not anything radical, but it’s consistent with what’s come before and it moves the character forward. Which was – essentially - the brief when I got the book. As for where do I think Supergirl sits within the DCU? I guess it depends. The perfect role for her - in my opinion - would be as either leader of the Teen Titans or as a sort of junior member of the JLA. In my mind she’s roughly analogous to where Kyle Rayner was back around the time of Grant Morrison’s run on JLA. She’s clearly at the pinnacle of that next generation of heroes - and certainly she’s potentially one of the most powerful heroes in the entire DCU - but she’s not quite experienced enough yet to sit at the top table comfortably full time and certainly not in a major leading role. Maybe someday that’ll change, but I don’t think so at the moment. Anj: You know, the Rayner comparison from JLA is spot on. I can remember Kyle meeting Hourman and Hourman saying something like 'why do you perseverate over Hal Jordan; you are as good as him'. He always acted like he belonged at the kids' table ... but then, by the World War 3 arc, grew into the hero he is today. Morrison's JLA run was magical. Bernard Chang really did some knockout art on the arc. Did you work closely with him on page layout and panel construction? JP: No, we didn’t. I just wrote the scripts the way I felt they should be written and Bernard just drew them. There were a few occasions where Bernard would ask about changing a detail or a splitting a panel, but generally he draw what I wrote. There was very little back and forth. 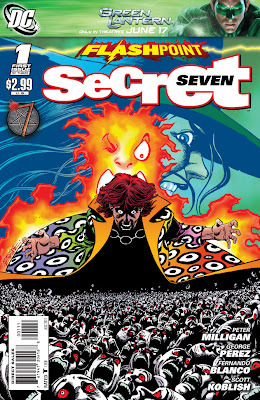 That said, Bernard’s art fundamentally influenced the way I wrote the book from my second solo issue (issue 62) onwards. After seeing how good he was it just freed me up to write the book in a slightly more expansive and bolder way. I’m especially proud of the splashes and spreads we cooked up. 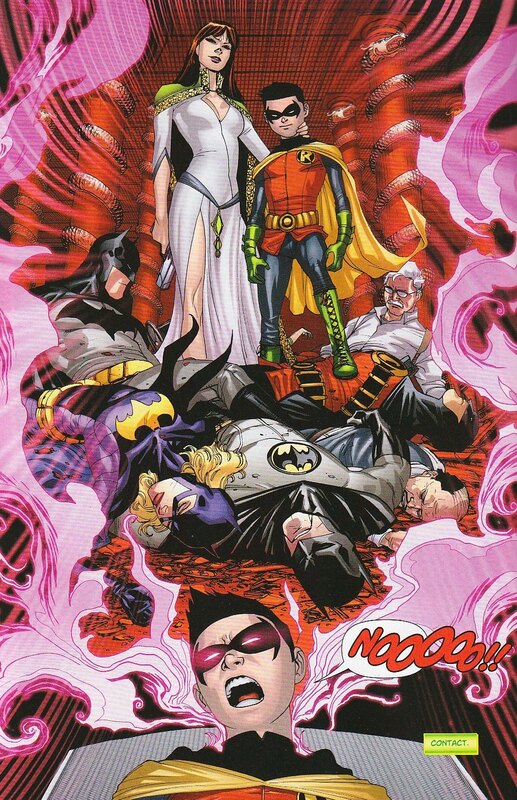 The Robin one I mentioned before was terrific, the ones at the end of issues 62 and 63 are both pretty superb, but I have to say that I think the ‘Alex-having-the-plot-downloaded-into-his-brain’ double pager in issue 64 is pretty special. If only for the fact it’s such a bonkers piece of storytelling. But why not?!? I knew Bernard could do it and it made a dull exposition scene - and exposition is dull at the best of times - a hell of a lot livelier on the page. But I wouldn’t have had the nerve to do that if Bernard and I hadn’t established a pretty good rapport over the course of the previous issues. Anj: Your time at the helm of the book is officially over. If you were still on the book, any idea where you would take Supergirl next? JP: Hard to say, really. As I mentioned before, the whole relationship with Lois would be interesting to play with and I think that dynamic would be fun to explore. In terms of Kara’s adventures, I guess you’d just want to make sure she moves forward. I think her greatest strength as a character, actually, is that she’s very similar to Superman and yet she isn’t him. And what I mean by that is that you get to play with the iconography etc without being imprisoned by some of the other paraphernalia. You can be respectful of the legend, but not hidebound to it and that’s very freeing. If anything, I think I’d like to put her in stories you wouldn’t expect and really try to mix up the tones and genres. Have her character be consistent, but place her in a milieu that’s a little stranger than your average DC title has become. Make it a sort of sideways glance at the DCU, if you will. How would she relate to characters like John Constantine or Etrigan or Animal Man? What about if you took her off-world for a while? Maybe that all sounds quite scattershot and bonkers and makes everyone hugely relieved that I’m off the book, but I just think if you get the gig and a blank sheet of paper you’ve got to go for it. We can all dream! Anj: I wouldn't mind seeing Supergirl meet up with the more bizarre side of the DCU. Of course, I also once wrote a fan letter asking DC to have John Constantine guest star in Hawk and Dove. JP: Now that sounds like a book I’d buy! Anj: Thanks again for answering some more questions James. And thanks for writing such a strong, intelligent Supergirl! Look forward to whatever you do next! JP: Thanks, Anj. It’s been a pleasure.